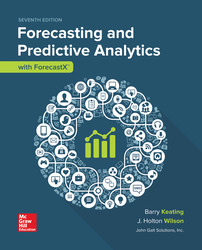 By Barry Keating and J. Holton Wilson and John Solutions Inc.
• Offers the most practical forecasting book on the market with the most powerful software: ForecastX. • Includes major updates to predictive analytics, chapter learning objectives, and ForecastX software. • Delivers practical how-to forecasting techniques and dozens of real-world data sets while holding theory and math to a minimum.